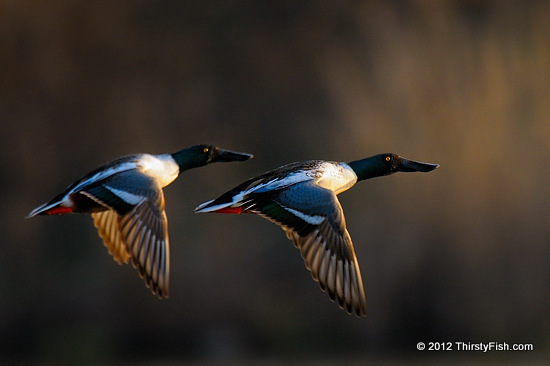 Northern Shovelers in Flight / Not Print-Worthy! John Heinz National Wildlife Refuge is about a 20 minute drive from Philadelphia. I visit the refuge when I do not have much time to go for a long drive elsewhere. Photographically speaking, some days at the refuge are not very exciting. On the day this photo was taken, light was poor and there were only a few groups of mallards, coots and shovelers dabbling around. Then suddenly, this pair of male Northern Shovelers took of and I managed to snap this while they were still low. For the photographers: The above image is not really print-worthy. Why? As you can see, the drake on the left is out of focus. If I had stopped down enough to get both ducks in focus, then I could not maintain a shutter speed to prevent motion blur. The camera I was using at the time, a Nikon D300, produces a clean image up to about ISO 800. Images are compromised above this value. The exif data for this photo showed that the focus distance was 165 feet. Stopping down to f/8 and raising the ISO value to 3200 would likely have rendered both drakes in focus. In fact, I find that a clean image at ISO 3200, without noise reduction, would be optimal for most situations that I encounter. Of course, without perseverance, equipment doesn't do much. If I had waited for the perfect light and I was lucky (and patient) enough to capture the two drakes at an optimal angular alignment, I would have been left with a print-worthy image. In fact, masters are less dependent on their equipment and more reliant on their vision and perseverance. In the early 20th century, before there was color film, a Russian photographer named Sergey Mikhailovich Prokudin-Gorsky used a self-designed view camera to capture color images. He exposed the same scene three times using Blue, Green, and Red filters. Gorsky's amazing work is displayed at the Library of Congress "The Empire That Was Russia" exhibit. Timeless!